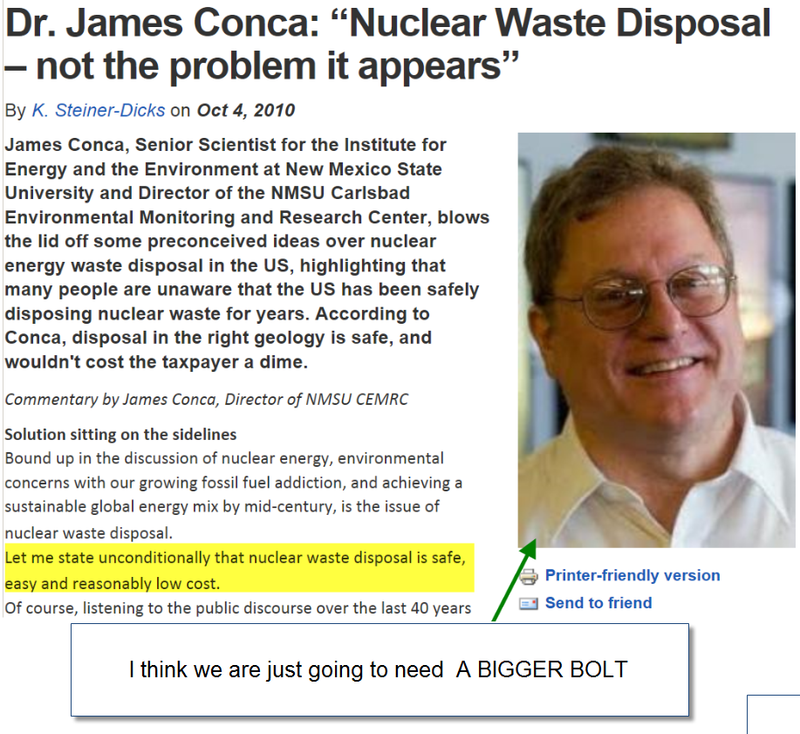 Nuke Pro: WIPP In Another Failure, Trying to 'Recover', Sounds Like an Alcoholic Rationalizing It's Precious! WIPP In Another Failure, Trying to 'Recover', Sounds Like an Alcoholic Rationalizing It's Precious! So here is the thing....I could put a 100 camera video monitoring system into WIPP for less than $20,000. However, they are going to spend $500M estimated to Recover the plant, so that means $1.5B. And with cameras they could see problems before they are big problems. They could also do post investigation and get better results. In fact they still haven't produced any real theory as to why the barrels blew up on Valentines night. And why the heck were 60 workers there on Valentines night? Sounds very suspicious, what kind of hanky panky was going on? But they still don't have cameras. And so a recent cave roof collapse that could have burst other radioactive drums occurred, and they didn't know about it until long after the fact. These asshats are just amazing. Its time to yank their contracts and get someone else in there. The fallen piece of ceiling was found in the Panel 3 access drift of the WIPP underground, an area that is already labeled as restricted due to low levels of radiation contamination in the area, the release said. Runyon said that problems in the restricted areas of the underground were anticipated after geotechnical inspections in November. Look they are already spinning....."it was anticipated"
Engineers have indicated that the area where the roof fall occurred can be re-bolted and recovered,” the news release said. It that all you folks do, is one recovery after another recovery? WIPP is wasting our money, lying to us, and putting our health at risk. Reminds me of Jimmy Conca....we just going to need a bigger bolt. And look at these lying asshats. A final report by independent researchers shows the radiation leak from the federal government's underground nuclear waste repository in southern New Mexico was small and localized.